The 3 Tesla Trio MRI and the 1.5 Tesla MRI, two sophisticated diagnostic tools, enable Hadassah Medical Center physicians to examine the functioning of the body in real time. Hadassah’s MRI machines work six days each week, around the clock. Last year, a total of 16,848 examinations were carried out on patients of all ages, in comparison to 15,662 in the previous year. Hadassah is the world’s leading center in introducing new cell therapies for Multiple Sclerosis (MS) through the use of stem cells. The MRIs are playing an important role in the Phase II stem cell therapy clinical trials under the direction of Prof. Dimitrios Karussis, head of Hadassah’s Multiple Sclerosis Center. With these Phase II trials investigating the optimal way of administering stem cell treatments, the MRIs enable the physicians to follow the effectiveness of the therapies. Participants undergo three baseline MRI scans before the injection of the stem cells and six monthly MRIs following the injection. 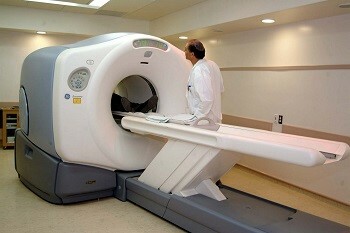 One additional MRI is also performed after 12 months. Hadassah’s functional MRI machines (fMRI) are also used to observe blood-flow in the brain. With these MRIs, physicians can examine the brain function of stroke patients, for example, and determine their response to commands, such as to move a hand or retrieve a particular word. While previously these sort of examinations were performed only on patients who were awake, Hadassah is now progressing to examinations on comatose patients, with a study headed by neurologists Dr. Shahar Arzy, MD, PhD and Dr. Netta Levin, MD, PhD. Now that it is known that the brain is constantly active, even in comatose patients with chronic conditions, Hadassah’s researchers are using the functional MRI to map brain activity over time in these unconscious patients. Hadassah also is a world innovator in the field of hyperpolarized MRI research, which aims to identify genetic anomalies and chemical changes during disease processes even before the disease is clinically apparent, making extremely early diagnosis possible. While at present the research is at the basic scientific stage, the ultimate goal is to attain the potential to use these techniques for human patients. (See Hadassah’s Center for Hyperpolarized MRI Molecular Imaging: a Pioneer in its Field ).